A Romanian Delegation visited Bell’s Amarillo Production facility Monday, March 5. Romania is Bell’s First Foreign Military Sale (FMS) customer that has requested pricing and availability on the H-1 Team – both AH-1Z and UH-1Y. During the visit Romanian officials were informed about the performances and capabilities of the AH-1Z and UH-1Y. Following their visit to Amarillo the delegation flew to Camp Pendleton to take part in O&I flights. The engagement with the USMC is the first step to establishing a strong relationship with the Romanian customer and the O&I flights are a key part of the Romanian evaluation process and furthering next steps. Marine Aircraft Group 39 pilots assist Romanian military officials in flying the UH-1Y. 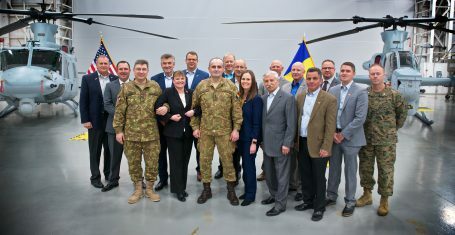 Members of Bell, as well as pilots from multiple squadrons around MAG-39, aided members of the Romanian military in testing, flying and the possibility of incorporating the UH-1Y platforms in their own military’s aviation structure. The Romanian Armed Forces are in the process of modernizing their military equipment – with a focus on interoperability with the US military and being a strong NATO ally. Romania recognizes the value that the H-1’s interoperability and commonality will bring to the Romanian military.